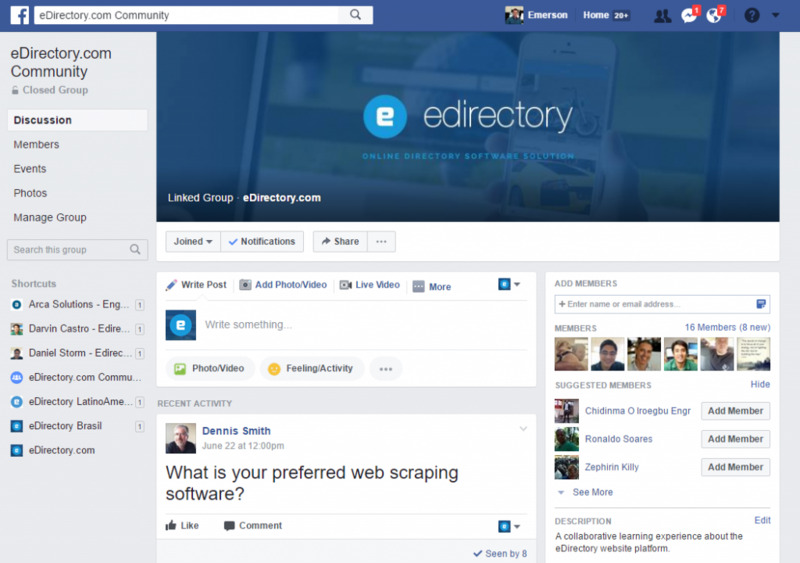 Join eDirectory Groups in Facebook and LinkedIn and get connected to people like you! The new eDirectory Groups of users is a proof that webinar events at eDirectory.com have been a relative success, both for eDirectory and it’s global community of directory software clients. As we got started we had a few interruptions with the new webinar software and getting familiar with how it all worked, yet we see the applications for our business and the benefits for our clients, so we will be moving forward with weekly webinars after a slight maintenance period to get the next series planned and executed. We have learned a great deal about what we can do to continue our mission of building the best directory software on the planet and we thank everyone for their participation thus far. Of the many pieces of actionable intelligence one we were able to roll out fairly quickly was the launch of our private partner strategy groups on LinkedIn and Facebook. We’ve already seen some directory owners interacting with each other and can see the potential for this as we continue to grow our community. We are committed to making ourselves accessible to all of our clients worldwide, no matter where they are, and these private groups are an excellent example of our goals here at eDirectory.com. Clients today have a myriad of resources at eDirectory like a knowledge base we constantly update, chat support, customer success agents on call, our blog, webinars, a support ticket system, and now our new private groups on social media. We hope to see both clients and those interested in launching an online directory website with eDirectory get all the information needed to have the best experience possible with our platform., and we are confident these new strategy groups will play a significant role in this goal. We will strive to take every piece of feedback we receive and based on it’s ability to be adopted throughout the platform, have it added to the MOD Store, and to or enact a fundamental change in the logic of the directory software system. Nothing is off the table! There are some exciting new optimizations and functionalities coming up on the next development cycle of the eDirectory.com directory software solution and some of those even came from our recent community events! We believe this is only the beginning of bringing our powerful community participants closer together online to power more “meaningful communities” for all our members and users to be a part of, one site at a time! We invite you to please join us in either our Facebook group found here or our LinkedIn group located here. Please feel free to get started with joining the groups, introducing yourself, inviting friends and family looking to launch for the $200 in Referral credits you’ll each receive, and getting ready to learn more and earn more with other online entrepreneurs and community leaders! Please keep the great ideas coming and we look forward to seeing our online communities grow, the same as we hope to see those of our clients’ online communities growing as well. Thank you for being the best part of eDirectory.com and we look forward to seeing what you build with our powerful directory software, cheers!